Take on the Taurus Mountains by 4x4 vehicle and white water raft on a full-day adventure tour that explores pine forests, medieval ruins, and the beautiful Koprulu River. 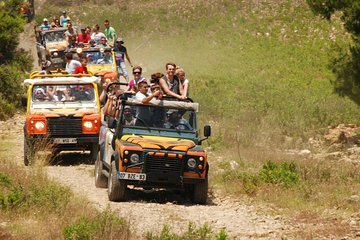 This Taurus Mountains adventure tour includes a guided Jeep tour of the mountains, a full lunch, and an afternoon white-water trip through Koprulu Canyon, as well as pickup and drop-off in Side and selected locations. Meet a driver at your hotel for departure to the village of Tasagil, where you’ll transfer into a Jeep with an open top and sides (see Important Info for pickup availability). Leave the town for a mountain track, passing through villages with small mosques and traditional stone architecture, and make a series of river crossings. Pause for a short swim break to wash off the dust, then continue through the pine forest to the site of some fascinating medieval ruins. Arrive at the Koprulu Canyon rafting base camp in time for a fresh lunch of grilled chicken, pasta, rice, salads, and seasonal fruits, fueling up for an afternoon of white-water rafting. Start with a safety briefing and the basics of white water paddling, then suit up in a wetsuit, personal floatation device, and helmet. Launch a white water raft into the Koprulu Canyon, paddling through 8 miles (13 km) of exciting white water. The Jeep convoy will rejoin you at the take-out point for the return trip to Tasagil. This full-day adventure tour concludes with transfer back to your hotel in Side.